It’s a troubling fact today that many Catholic children don’t know the basics of the faith. Many come to religious instruction in parishes without knowing how to make the Sign of the Cross or recite the Our Father or Hail Mary. Teaching children growing up in a secularized world, catechists and teachers can’t assume that their pupils know how to pray. A new book seeks to address this problem. 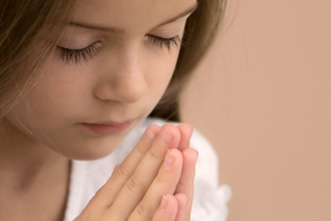 It’s called 70 Prayer Starters for Children…and those who teach them (Pauline), by Patricia Mathson, children’s ministry coordinator at Hope Family Center in Des Moines, Iowa. The book is based on the simple assumption that children (and all humans) have an innate ability and desire to reach out to a Being beyond themselves. Prayer is a natural part of human life. Start with something kids know about, such as a sick grandmother, Mathson suggests, and gently lead them to a sense of charity for others. The greatest act of charity is to pray. As the book progresses, Mathson introduces more advanced concepts and devotes a whole chapter on “praying with the Psalms.” For Jews and Christians, the Psalms represent some of the deepest, prayer-driven poetry ever composed, and Mathson, to her credit, does not feel they are too advanced for kids. Now is the time to introduce them to children, and she proposes some clever ways to do so. One way is to find in some Psalms various titles for God, such as God of all nations, God of forgiveness, God of love. It’s a spiritual treasure hunt. Focus on the Psalms is a natural lead-in to another kind of prayer practice, one that is still unfamiliar even for many adults—lectio divina. This ancient practice of “divine reading” not only to understand Scripture but to lead to “conversation with God,” is a type of prayer whose benefits may be endless and which has not been tapped into by enough Christians today. It’s not expected that children become spiritual masters, of course, but Mathson describes a way that lectio divina can be introduced. Pupils exposed to this now may very well find it easier to grasp later in life, as their spirituality deepens. The book culminates with a chapter in which children can explore the different parts of the Mass. In addition, children are introduced to the concept of the traditional kinds of prayer—blessing, petition, intercession, thanksgiving and praise. If a class can get through this book in one school year—or even if it takes several—students will be well on their way to being prayerful Catholic young men and women who will take their faith more seriously. And who knows, many children may bring the lessons home, helping their parents learn something about prayer. We can only pray. 70 Prayer Starters for Children is available from Pauline Books & Media.